Yes, there is a lot of buzz around this topic right now...books to read and share, videos to watch and posters to post. I believe (I really do) in the importance of growth mindset, honest I do, but sometimes I wonder if the books and the videos and the posters are having an impact on my students. We all know what it means to have a growth mindset....but when it comes to the actual struggle with a challenging task...well sometimes all that we learned from the books and videos and posters does not come in to play. This quote seemed a little different to me. It seemed to put a little bit more of an emphasis on the student, a little more accountability, more focus on action and could be taught and used daily...not just when faced with challenging tasks but for all tasks. 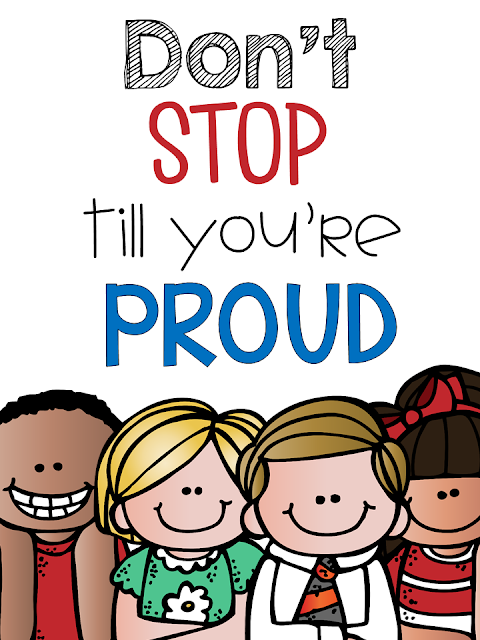 So, now this is posted in our classroom...and we talk about what it means to be proud, what we need to do in order to be proud of our effort and work. It does not mean it is perfect, or it is the best, or better than anyone else's. It means we gave our very best effort, we tried our hardest, we used classroom tools, we asked for help, we did not give up!